Ha Long Bay and Bai Tu Long Bay of the submerged dragon boast 3000 craggy and towering islets and are among the most picturesque places in Vietnam. The fantastic beauty of the bays has given rise to many legends, some of them dating back to the ancient past. It is said that a dragon descended into the deep water spitting out gems as he did so. And thus the rocky islands were formed. Departing Hanoi from your hotel from 7:15 to 7:30, we drive to Cai Rong Island. 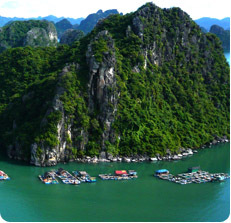 Soon after arriving in Cai Rong, we embark on a boat trip among the spectacular limestone peaks. Following that we take a kayaking ride among beautiful rock formations. There is an opportunity to swim in the clear waters. 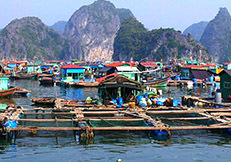 We continue boating to see the extension of Bai Tu Long Bay. The return journey follows a different route, allowing us a few hours to appreciate the tranquil beauty only found in Bai Tu Long Bay and the picturesque floating village of Cai Rong. Next we hike up to one of towering mountains to have the perfect panoramas of the bay. Returning to the mainland we board our vehicle for our returning journey to Hanoi, arriving there at about 7pm. (Lunch is included). + a 1-hour kayaking ride. Tour guide(s): friendly tour guide(s), our guide(s) speak fluent English. They are knowledgeable about local culture, history and the environment. We choose local ingredients, typical of the way people eat in the area, at local restaurants, homes or markets. (We cater for Vegetarians). - $110USD per person for a group of 2 people. - $86USD per person for a group of 3 to 8 people. The cost of the trip includes transportation, tour guide, all meals, admission fees and permits where applicable. The cost of the trip does not include travel insurance, drinks (soft drinks, alcohol, bottled water) and personal expenses. What to take: pack essentials, including light comfortable clothes suitable for outdoor activities, comfortable walking shoes. Take a small day pack for kayaking.